Making compo dough. Photo: Lenna Tyler Kast. Anyone who has ever walked through historic houses and large public buildings, visited an art gallery, picked up a picture frame in an antique shop, or even ridden on an old carousel has been close to composition ornament, but has probably not known what it was or how it was made. This is not surprising, since composition or "compo" was conceived as a substitute for more laboriously produced ornamental plaster and carved wood and stone, so was intended to fool the eye of the viewer. The confusion has been heightened over time by makers who claimed to be the sole possessors of secret recipes and by the variety of names and misnomers associated with the material, including plaster, French stucco, and Swedish putty, to name a few. Many natural or man-made materials can be made soft or "plastic" by the application of heat and are called "thermoplastics." Composition is a thermoplastic material used to create sculptural relief. It is soft and pliable when pressed into molds; becomes firm and flexible as it cools; and is hard and rigid when fully dry. Typically formulated with chalk, resins, glue, and linseed oil, this combination of materials gives compo its familiar light-to-dark brown color. It is the only one of the so-called thermoplastic materials to be used extensively in architectural decoration because of its low cost. Generally adhered to wood, historic composition ornament is most often found decorating flat surfaces such as interior cornice and chair rail moldings, door and window surrounds, mantelpieces, wainscot paneling, and staircases-indeed, anywhere that building designers and owners wanted to delight and impress the visitor, but stay within a budget. While composition was cheaper than carved ornament, it was still meticulously hand made and applied; thus, it was more often used in "high style" interiors. But the types of structures historically decorated with composition ornament were more democratic, encompassing residential, commercial, and institutional buildings, and even including specialty applications such as the social saloon of a steamship. With proper understanding of the material, historic composition ornament may be successfully cleaned, repaired, or replaced in sections. Unfortunately, because composition is often misidentified as plaster, stucco, or carved wood, the use of inappropriate methods for removing paint is a major cause of its loss. 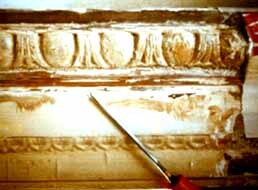 The purpose of this Brief is to to assist historic property owners, managers, architects, craftsmen, and preservationists in identifying existing composition ornament, determining the extent of repair and replacement needed and, finally, selecting the most sensitive, non-destructive method of treating it. The basic ingredients (clockwise, from left) are chalk, glue, linseed oil, and resin. Photo: Jonathan Thornton. While various types of moldable composition date to the Italian Renaissance, architectural use of composition did not begin to flourish until the last quarter of the 18th century. During this period, many composition ornament makers in Europe and America supplied the public with complex sculptural decoration. 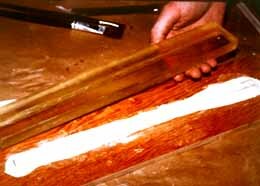 Also, the overly complicated and often intentionally mysterious earlier recipes were now reported to be comprised of a few basic ingredients: animal glue, oil (usually linseed), a hard resin (pine rosin or pitch was cheapest), and a bulking or filling material, generally powdered chalk or whiting. Chalk is whiting in solid form. It is a type of white, soft limestone. Before the invention of synthetic adhesives, glue meant animal or hide glue. This was made by boiling animal skins to extract a protein-collagen-in water, then condensing and drying the collagen until it was in solid form. A variety of types and grades were, and are still, available. Two are shown here. This is a yellowish drying oil obtained from flaxseed that is used in paint, varnish, printing ink, and linoleum; it is a key ingredient in composition ornament. Resins are organic materials present in wood and exuded from various trees and shrubs. 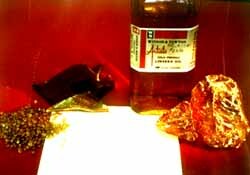 In unrefined form, they often consist of a mixture of solid natural polymers, oils, and volatile aromatic substances. "A cheap substitute for wood carving has long been desirable for some situations, particularly enriched mouldings, etc., and various were the attempts to answer the purpose, the last and most successful is usually termed Composition Ornaments. It is a cement of solid and tenacious materials, which when properly incorporated and pressed into moulds, receives a fine relievo; in drying it becomes hard as stone, strong, and durable, so as to answer most effectually the general purpose of Wood Carving, and not so liable to chip. This discovery was rudely conducted for some time, owing to Carvers declining every connection with it, till, from its low price, it encroached so much upon their employment, that several embarked in this work, and by their superior talents, greatly improved it." In brief, compo is perhaps best understood as an early thermoplastic that allowed the rapid reproduction of complicated detail for popular use. Since the craft has essentially remained the same over time, a description of its historic manufacture is also applicable today. This shows the process of pressing or squeezing compo into a mold using a screw press. Photo: Jonathan Thornton. In one container, chunks of amber colored pine rosin or the cheaper black pitch were heated in linseed oil until they melted together and combined completely. In another container (often a double-boiler), previously soaked chunks of animal glue derived from skins and hides were cooked and blended into a uniformly thick solution. The two liquid components were then stirred together. This "batter" was made into a pliable "dough" in a way familiar to any baker. It was poured into a cratered pile of whiting and first mixed with a spatula until it was thick enough to be kneaded by hand. Vigorous folding and kneading in of more whiting was done until the composition had a consistency like modeling clay and was completely uniform. To mold a decoration, the compo was first warmed in a steamer, and the mold prepared with a thin coating of oil and a dusting with talcum powder. A piece was then kneaded and folded to produce a smooth and wrinkle-free surface on one side. The good side was placed down over the rigid mold, and pressed in loosely with the fingers, leaving excess above the surface of the mold. A damp board was placed over this and the "sandwich" placed in a screw press and squeezed so as to force the compo into the finest detail. 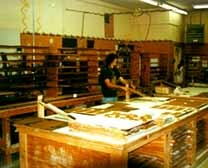 It was then removed from the press and turned over so that the mold could be lifted straight up, leaving the compo stuck to the board. Upon cooling to room temperature, the compo gelled, becoming tough and rubbery (the gelling property is due to the glue component which is chemically identical to edible gelatin). At this stage, it was sliced off the board with a thin-bladed knife. The remaining mass of composition still adhered to the board could also be sliced off and reused. Composition ornament was often fixed to an already prepared wooden substrate at the factory while it was still fresh and flexible, but could be dried and shipped to the final user, who would make it flexible again by steaming on a cloth stretched over a container of boiling water. Instructions for doing this, as well as suitable brads for "fixing," were supplied by some manufacturers. Ornament is being sliced from a pressing board. Photo: Lenna Tyler Kast. Because of the glue component, steaming the backs of ornaments would make them soft and sticky enough to self-bond without additional glue. Soft ornaments were softened nailed through or pressed down on top of previously driven headless brads (also called sprigs). Strings and wires were often included in the mass during pressing to serve as internal armatures and reinforcements. These measures preserved the integrity of the ornaments even if they cracked. Originally meant to copy other materials such as wood, plaster, and stone, composition had its own unique properties and advantages that were soon exploited in both technical and artistic terms. It has distinct characteristics in each of its three states: pliable, rubbery, and hard. When warm and pliable, it can be modeled by a skilled worker and it is capable of receiving the finest detail when squeezed into a mold. After it has chilled to room temperature and is gelled, it is rubbery, flexible, and tough. The detail is essentially set and cannot be easily damaged as the ornaments are manipulated. Gelled composition ornaments can be easily bent over curved surfaces without cracking, and unlike a rigid cast material such as plaster, they can be stretched or compressed somewhat to fit a design without damaging the detail. An egg and dart motif, for example, could be made to come out evenly at the corners without making a partial egg or dart. The sculptural vocabulary from the maker's mold collection could be re-arranged at will into larger decorative schemes. In fact, any smaller component of a decoration from a single mold could be sliced free and inserted into any location. Composition could be carved to heighten detail, correct defects, or undercut ornaments-that were, of necessity, straight-sided-so that they would release from the rigid molds. This could be done in the gelled state or, with more difficulty, after it had finally hardened to stone-like solidity. Finally, when completely hard, it could be given a polished marble shine with nothing but a damp cloth. It could be stained, coated with any sort of paint, varnish, or oil gilded without any further preparation. A technical discussion of composition is not complete without an examination of the molds used to create the ornament. These were the ornament maker's largest investment in time and expense, and were the key to the craft. Composition molds were always made of rigid materials that would withstand the considerable pressure used in pressing the ornaments. All of these materials and methods have been used in sculptural crafts since the Renaissance. The comparative listing that follows helps explain their advantages and disadvantages. Wood was carved in reverse to create a negative matrix. This was highly skilled work often performed by a specialist carver, and required a large initial investment in time, but wooden molds would essentially last indefinitely if properly maintained. A further design advantage of reverse carving is that fine incised lines will show up as fine raised lines in the final ornament. 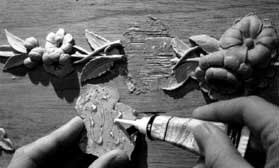 (Fine raised lines are notoriously difficult to carve or model in relief.) Molds carved from dense and close-grained fruit woods such as apple and pear seem to have been common in the 18th century. In the 19th century, the most intricate molds were carved in boxwood, often encased or framed by larger and cheaper pieces of timber for ease of handling and to prevent splitting. Metal alloys such as brass, bronze, and pewter made excellent molds capable of yielding the highest level of detail and were virtually indestructible in use. They were expensive due to the intrinsic value of the metal and because their production involved a variety of complex and skilled steps performed by modelers, pattern makers, and founders. Few historic metal molds have survived, possibly as a result of war-time scrap drives. Sulfur melts into a clear fluid at about 115 C and could be poured over a positive clay model or another compo ornament. A sulfur mold resembles hard plastic, but is more fragile. Even when framed in wood and reinforced with iron fillings, as was common practice, it was especially vulnerable to breakage. A figural design, such as a frieze of The Three Graces, was much easier to model in relief than to carve in reverse, and sulfur was one of the few materials that could be used to make a hard mold from a clay model. This finished length of compo molding is stuck to its pressing board. The newly made piece will be sliced off the board, then applied. Photo: Jonathan Thornton. Composition itself could be squeezed over a hard relief pattern (such as another manufacturer's ornament) to make a mold. Composition shrinks as it hardens and so the mold was always smaller than the original. It is also fairly brittle when hard and, like sulfur molds, would tend to crack in the press. Composition "squeeze molds" were ideal for pirating another maker's patterns! 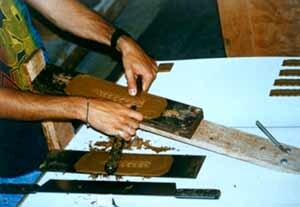 Pitch molds became popular during the late 19th and early 20th centuries. A warm and soft mixture composed primarily of pine pitch was poured into a recess in a wood block or frame. It was then turned over and squeezed down onto an oiled wooden pattern. Pitch molds might crack with age or in the press, but as long as the carved pattern was retained, they could be easily re-made. Press-molded decoration has been used with various soft plastic materials for centuries. For example, it is known that medieval sculptors press-molded organic mixtures to decorate painted sculptures. But because mixtures based on organic binders such as glue, oil, resins, and waxes are prone to various sorts of degradation, actual survivors are rare. The direct ancestors of the composition craft are most likely found in the Italian Renaissance; however, composition mixtures were not extensively used for architectural decoration during this period, probably due to building traditions as well as relative expense. It is worth nothing that this was an age of experimentation with materials and rediscovery of Greek and Roman designs. Press molded mixtures called pastiglias were used to decorate wooden boxes and picture frames as early as the 14th century. Moldable compositions were discussed by various Renaissance writers. The recipes are extremely varied and include, among their more common and understandable ingredients, gypsum, lead carbonate, wood and marble dust, eggs, pigments, sheep's wool, and various oils and resins. The first flowering of architectural composition in America took place at the end of the 18th century when ornaments were both imported from England and produced by makers in every major eastern city. All of the conditions were right: molding technologies were well established (architectural papier mache, which, like composition, was produced in molds, had gained widespread acceptance during the middle decades of the century). The raw materials were produced or imported in volume, so the cost of the composition ingredients came down as the cost and availability of highly skilled labor went up. Economic and social conditions favored centralized "manufactories" in the production of various arts and crafts. Design trends also fed into a favorable reception for composition. A more faithful reinterpretation of Greek and Roman design eventually termed "Neoclassical" had taken hold in Europe, championed in England by the architect, Robert Adam, after his return from study in Italy in 1758. Although Adam played no direct role in the "invention" of composition ornament, as has sometimes been said, he patronized English craftsmen who were making it and was generally receptive to new and innovative materials. One early maker, sometimes cited as the "inventor" of composition by his contemporaries, was John Jaques. His name appears in London advertising by 1785, but he was probably in business before then. As a result of Adam's influence, designers of applied ornament in both Europe and America began to take advantage of a molding process that was ideally suited to producing the detailed, but repetitive, motifs of classical decoration--acanthus leaf, egg and dart, festoons, swags, and paterae--as well as classical themes depicting Greek and Roman gods and goddesses. And as the Neoclassical style became more popular, composition ornament makers increased in number. 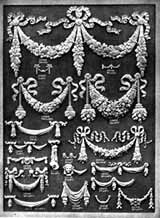 Festoons and fabric swags in composition ornament are shown from a manufacturer's catalog. The company, established in 1893, is still in business today. Photo: Courtesy, Decorators Supply Corporation. During the early decades of the nineteenth century, Neoclassical--encompassed in America by the terms Federal, Empire, and Greek Revival--was in the ascendancy. Composition makers continued to increase and also to find new uses for their material. Composition picture and mirror frames became common and some makers advertised the suitability of composition ornaments for casting iron firebacks and stoves. Composition ornament was explicitly advertised for exterior use as well, although very little has survived. The interiors of houses and public buildings in every prosperous American city were decorated with composition. Along with a proliferation of styles in the mid-to-late decades of the century, there was a parallel growth in the number of moldable and castable materials that shared some features of the composition craft, such as carton pierre, gutta percha, fibrous plaster, shellac compositions and, eventually, elluloid and hard rubber. Composition continued to be the preferred material for detailed decoration on wood where the size of the ornament did not make its cost prohibitive. The publication of practical books by and for craftsmen, beginning in the 19th century, disseminated recipes and procedures to a broad audience and de-mystified the craft. Period composition ornaments called "imitation wood carvings" were widely advertised in manufacturers' catalogs. Balls of prepared compo became available from some art supply shops in large cities for use by small volume craftsmen. During the later years of the century, the Arts and Crafts Movement-as preached by William Morris and his associates and followers-became increasingly important in design and philosophy. Morris stressed honesty to the material in design, exalted spirituality of hand work and rejected manufacturing, mass production and the distinction between "high" art and craft. These trends were to affect both technology and design in the 20th century. Composition ornament would have been anathema to Morris and his elite clients; most composition production during the last years of the century is best described as Victorian Eclectic. The Arts and Crafts and related styles, such as the more decorative Art Nouveau, were well rooted in America by the beginning of the century. Pitch molds made from relief-carved patterns had become common in America. The carving tool marks could be accentuated in these patterns in keeping with current vogue. Open-grained woods, such as mahogany, were often chosen so that the finished composition ornaments would have a wood-like grain that showed through stains and varnishes. A uniquely 20th century application of composition ornament was in the lavishly decorated movie palaces of the Depression era. As interest in architectural embellishments declined, particularly as a result of the austere post-World War II styles, so did the composition trade. Shown is the contemporary studio of J.P. Weaver Company. It has manufactured and sold architectural composition ornament continuously since 1917. Photo: Lenna Tyler Kast. Many old firms went out of business and their molds were dispersed or destroyed. The few that remained concentrated on restoration projects or were sustained by diversification into other materials. By the 1950s and 60s, composition as a material and craft had been all but forgotten. An upsurge in hand craft production that started in the late 60s and has continued to the present-as well as increasing interest in historic preservation-has led to the renewed study of old methods and materials, including composition. The few manufacturers that remain have seen a large increase in their business, and an increasing number of people recognize composition as a unique ornamental material and want to conserve, restore, or create it. To some degree, the longevity of historic composition ornament is related to the ratio of ingredients in the original mix and to the skill of the craftsman in applying it. But it is far more dependent upon interior climatic conditions and the long-term effects of heat and dampness on both the compo and the wood substrate. Dried compo is inherently hard and somewhat brittle; its increasing brittleness over time is primarily due to the oxidation and hardening of the linseed oil component. The drying oil, in turn, contributes to age cracking. Thus, during initial manufacture, if the oil content was low and the dry filler content (chalk) high, shrinking and cracking over time is less likely to occur. Originally, the compo was probably attached using small, headless brads (1/4") that penetrated the hardening compo as well as the wood substrate. They were used to keep the compo from shifting or warping after it was set in place. If an insufficient number of brads was used by the craftsman during the application process, the compo simply falls off as cracks develop. 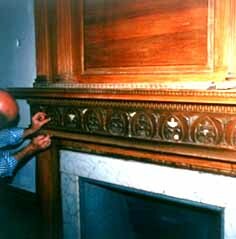 A conservator replaces broken pieces of compo ornamentation on a mantel during a restoration project. Photo: Courtesy, Irving Haynes and Associates. Compo was conceived as a durable substitute for hand-carved wood or marble and decorative plaster; its potential for structural failure is generally due to substrate failure rather than to the compo mix itself. Theoretically, composition will move with atmospheric changes due to the moisture-sensitive glue component. Its breakdown typically occurs when the wood base expands and contracts at different rates than the compo during extreme temperature and humidity fluctuations. Especially when it is close to a source of heat, such as directly over a fireplace, compo develops fissures or shrinkage cracks. Contemporary heating systems in old buildings also contribute to the drying and cracking syndrome. Simple stabilization and repairs to existing ornamentation can most likely proceed based solely on an analysis of existing conditions (see paragraphs on Surface Cracking and Delamination, below). For more complex work, a building owner, curator, or conservator should research the history of the building to find out when it was originally designed and constructed; who lived in it at various times; how the building was used; and which features were original and which were added later or removed. Some of this information may be found in the National Register of Historic Places. Questions about the building's interior spaces and their decorative detailing also need to be asked, particularly when portions of the ornamentation will be replaced. Have the interior spaces evolved with successive occupancies or uses? In addition to compo, were other decorative materials used and are there differences in patterns that help date the work? For example, plaster and compo may have been used in the same room, but applied at different times. Receipts from workmen's bills may often be used to establish the dates of decorative detailing. The historical research dealing with the original construction of the building and its use over time should, in turn, be linked to the scope of work that will take place. Stabilization, conservation, and repair are maximized within the treatment, Preservation. Generally speaking, restoring decorative ornament to a specific earlier period is not recommended unless its historical significance outweighs the potential loss of extant ornament that characterizes other historical periods. But if a significant interior is missing original features and physical and documentary evidence are conclusive, replication may be appropriate in order to interpret a particular time. After historical research is conducted, but before starting work, an analysis of the surface and substrate should be undertaken. These are some of the issues a conservator considers. 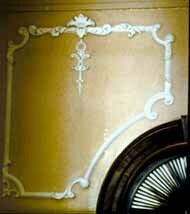 First, if a surface is painted, the ornamentation material needs to be identified. Is it wood, plaster, composition ornament, or some other type of applied ornamental material? Usually, some of the ornamentation is chipped or broken. Close examination of the exposed material is the first step. If it is white through the entire thickness of the ornament, then it could be plaster or stucco; if it is a darker brown material, it is more likely to be composition. This conservator is carefully re-gluing composition ornament in place. Photo: Jonathan Thornton. After having identified the presence of composition ornament, its overall condition can be evaluated. Layers of paint may obscure fine detailing as well as deterioration problems. Degrees of damage and deterioration should be recorded. These are typical questions that need to be answered. Is the surface merely "crazed", requiring no action or limited repair, or are the cracks severe enough to require replacement? Are pieces missing? Are the attachment brads rusted or missing? The condition of the substrate is also important. Is the wood surface intact, or is it in need of repair? After answering key questions, the conservator will make random tests to differentiate original compo from later repairs, some of which may well have been done with plaster, rather than compo. Deciding how to proceed depends upon the overall interpretive goals of treatment. For example, is the interior being restored to an earlier time? In this case, later repairs may be removed and the original appearance replicated. Or is the interior being preserved with limited replacement of lost or damaged historic materials? Not all conditions are foreseeable in conservation work and contingencies must be incorporated into the treatment plan to be considered realistic. As the project progresses, the conservator generally determines the work that needs to be done, and the order in which it should be undertaken. The scope of work is generally based on several factors, including the historical significance of the building's interior, the degree of damage or deterioration of the compo, and the overall interpretive goals of project work. Several examples of repair and replacement follow in order to suggest a typical scope of work within preservation and restoration projects. Treatments are listed in hierarchical order, from the least intervention to the greatest. When this historic composition window surround was mistakenly identified as plaster, then treated with a caustic stripper, a section of it was destroyed. Photo: Bryan Blundell. Interior ornament is usually painted many times over during its lifetime and, as a result, the sharp surface detail of the original pattern is obscured. Before attempting to remove paint, it is always advisable to obtain professional advice on the ornamental material to be cleaned as well as the nature of the coatings that are covering it. And whatever the project work goal, at least one sample of intact, well-adhered paint layers on a feature should be preserved for future historical research. Based on the purpose of treatment, these are some of the questions a conservator routinely asks. How many layers of paint are there? Is it important to trace one layer to a particular occupancy of the building? If so, the stratigraphy (or layering scheme) will be determined prior to paint removal. After the correct layer is identified, the color can be matched. Or, is the building being rehabilitated? If this is the case, period-typical paint colors may be appropriate. For purposes of this Brief and the guidance paragraphs that follow, it is assumed that all layers of paint are being removed in order to reveal the fine detailing of the composition ornament. The next step is to consider various methods of removing paint from the ornament without damaging it, or without being exposed to dangerous substances in the strippers or in the old paint itself! It should be noted from the standpoint of health and safety that most Federal and Empire period compo was meant to imitate marble; thus, the highly toxic white-lead paint was by far the most common original coating. Caustic strippers based on lye should be avoided for two reasons. First, they will damage and dissolve compo both because they "chew up" the protein structure of the glue and, second, because they are water-based and compo remains soluble in water. If a stripper will damage the protein of your hands, it will do the same to compo! A conservator will more often use organic solvents, such as methylene chloride, in conjunction with small implements such as a dental tool or toothbrush. (A small area is always tested first to establish the safety and effectiveness of any technique. Improper use of stripping tools can damage intricate surfaces beyond repair.) A solvent is applied according to manufacturer's recommendations, permitted to soak into and soften the paint, then re-applied as necessary, as the conservator gently removes paint from the intricate carved surfaces. It should be emphasized that any amount of exposure to toxic chemicals without proper precautions can cause severe health problems. A hooded, air-fed, personal unit is desirable when using methylene chloride-based strippers if fume hoods or paint spray booths that exhaust effectively to the outside are not available. Organic vapor masks may not be as effective in protecting against methylene chloride exposure because the filters quickly become exhausted; however, a vapor mask with properly rated organic solvent cartridges can provide an acceptable level of safety when cartridges are regularly changed. Some conservators have had excellent results heat-stripping excess paint layers using heat guns and dental tools. This is highly skilled work and its success depends upon the composition ornament being much older than the paint layers that lie on top, but has the capability of working as well or better than chemical methods in the hands of an expert. Precautions must be taken against lead fumes where removal of lead paint is involved. Cleaning mixtures based on enzymes are also used by conservators. This is an effective method because enzyme mixtures can be formulated for very specific purposes (i.e., to dissolve only oil-based paints from protein-glue based compo). They dissolve paint without affecting the wood substrate. But, on the other hand, work can be very slow and the expense would only seem justified on small and rare or important museum objects. Enzymatic cleaners are dependent on a high level of skill, technical knowledge and professional training, but they are earning a solid place in the repertoire of professional conservators. Increased concern about the environment may well render the toxic methylene chloride strippers obsolete in the near future. Manufacturers have already produced "safer" strippers based on dimethyl esters, and further research will probably yield other alternatives to chlorinated solvents. Slower acting solvent-type strippers may well be safer to the underlying composition ornament, but additional research and use are needed before making definitive statements. In summary, most damage to compo occurs during the removal of layers of paint; this is a critical process and should not be attempted without consulting a conservator and should not be undertaken by painting contractors unless they are highly skilled and have had extensive experience in this very delicate procedure. Proper disposal of residual chemicals and debris must be undertaken to avoid contaminating the environment with solvents and lead, and such disposal is, in fact, now required by federal, state, and local ordinances. The company responsible for removing chemical waste should be licensed to dispose of it, otherwise the property owner may be held accountable if disposal laws are violated. Refinishing compo ornament usually follows stripping. According to historic evidence uncovered and depending on the existing and desired appearance of the room, compo can be stained, painted, gilded, marbleized, or glazed. Paint types may include distemper, alkyd oil, or latex. A thin coating is recommended so the intricate surface detail is not clogged. Surface cracking indicates age and, thus, the history of the ornamentation itself. It does not necessarily mean that cracks have to be fixed. But if cracking interferes with the overall design pattern, then the conservator may elect to fill the cracks with suitable fill material. For example, "light weight" spackles bulked with microballoons are excellent because they are soft and compressible and will accommodate changes in the size of cracks due to moisture fluctuation. After stabilization, the surface is finished to match the existing area. Delamination or separation of the compo from the wood substrate is the simplest repair problem to remedy. The conservator begins by testing cracked areas with slight finger pressure to determine which parts of the design need consolidation. Compo sections that have separated from the substrate, but are otherwise intact, can be glued back in place using emulsion type adhesives such as "white" glues or a clear, solvent-release adhesive. For vertical surfaces, the glue is painted onto the back of the delaminated compo as well as the wood base and, when slightly tacky, re-attached, and held with clamps until dry. Professional conservators often formulate their own adhesives based on stable synthetic polymers (plastics) dissolved in solvent that will be more reversible, should the need arise, and also offer better long-term stability than many commercial adhesives. When some original compo has been lost, additional work is required to make a repair. One particularly easy and inexpensive method of repairing broken ornamentation is to use non-hardening clay ("plastilina") or polymer-based modeling materials as an impression material to make a mold. After a mold is made from existing ornament, missing or deteriorated portions of the historic design can be duplicated with a durable gypsum plaster. Especially in cases where economic considerations dictate procedure, use of this substitute material may be helpful because it is cheaper. Alternatively, an existing studio mold may sometimes be used to make small replacement pieces in a repair project. In another scenario, a repetitive design on a mantelpiece may be damaged or portions missing. Especially if the compo design is complex and several portions of ornament need to be replaced, rigid polymer molds with traditional compo are recommended for the repair work. The mold is created using a section of the original ornament as a model. After replacement pieces are fabricated, they are attached using brads, or finish nails. The pointed end of the nail is clipped blunt with snips to avoid possible splitting of the wood substrate. The nail is first hammered into the surface, then countersunk, and the resulting hole filled with gesso putty or additional compo. Finally, a ready-made replacement piece can be ordered from the catalog of a compo manufacturer, but it is unlikely to be a perfect match to an extant historic decoration. Once-attractive compo may become damaged to such a degree that the remaining fragments are removed by an owner and the entire surface painted over. Thus, if there is some existing composition ornament in a room, such as an overdoor or chair railing, the conservator would most likely look for evidence of other ornament that is now missing. Based on documentary and physical evidence, missing composition ornament was re-created. Photo: Jonathan Thornton. When the paint stripper dries, a ghost mark left by composition ornament appears slightly darker than the surrounding area where no compo had been attached. In addition, small, square-headed, 1/4" brads used to reinforce the original compo may be embedded in the wood. In summary, detailed physical evidence, as well as written and pictorial documentation, can provide a valid framework for replacement at a particular site. With careful detective work, missing historic ornamentation may be successfully identified and replaced with matching ornament. When ornamentation is extensively deteriorated and missing, owners often want to re-create the historic appearance through restoration. Physical evidence and other documentation may be used as a basis for the restoration; it should be remembered, however, that as the amount of surviving material diminishes, the greater the chance for inaccuracy when attempting to depict the historic appearance. Choosing restoration as a treatment thus requires exacting documentation prior to work and meticulous attention to detail in the work itself. Despite its popularity and widespread use as a decorative material, the history of composition ornament has yet to be thoroughly studied. Individual craftsmen have acquired fragmentary knowledge about some designs and historic methods; historians and students of interior decorative design have accumulated knowledge about patterns, artisans, and methods of manufacture and distribution; and curators of historic collections that include compo are knowledgeable about the objects under their care. The combined knowledge of these individuals, together with examples and images of compo ornament from a variety of sources, needs to be synthesized to address the complex issues involving compo repair and preservation. The future of the study of composition ornament, as well as many other facets of architectural, decorative, and fine art history, lies in this sort of cooperative effort. Kay Weeks, project director for this cooperatively produced Brief, is an art historian who serves as technical writer-editor in the Preservation Assistance Division. Jonathan Thornton authored the historical overview portion of the Brief and William Adair, FAAR, the planning and treatment portion. The editor and authors wish to extend their gratitude to those people who reviewed and commented on the Preservation Brief in draft form and those who provided illustrative materials. First, National Park Service staff reviewers included H. Ward Jandl, Blaine Cliver, Anne E. Grimmer, Chuck Fisher, Tim Buehner, Emogene Bevitt, Tom Jester, Michael Auer, and Paul Alley. Specialists in the field included Andrew Ladygo, David Flaharty, Phil Gottfredson, Mark Reinberger, and Lenna Tyler Kast. Photographs were generously donated for the Brief by Philip L. Molten, Elizabeth Brick, Robert J. Rucinski, Lenna Tyler Kast, Bryan Blundell, Thomas Brunk, Lonnie J. Hovey, AIA, Roland White, Irving Haynes & Associates, Philadelphia Museum of Art, Cleveland Museum of Art, the Freer Gallery of Art, Winterthur Library, Decorators Supply Corporation, and Rapid Photography, Inc.
Adair, William. "An Investigation of Composition Ornamentation." The Interiors Handbook for Historic Buildings II. Washington, D.C.: Historic Preservation Education Foundation, 1993, Chapter 4, pp. 1-7. Adair, William. The Frame in America, 1700-1900: A Survey of Fabrication, Techniques and Styles. Washington, D.C.: The American Institute of Architects Foundation, 1983. Budden, Sophie (ed.). Gilding and Surface Decoration. London: United Kingdom Institute for Conservation, 1991. See: Judith Wetherall, "History and Techniques of Composition," pp. 26-29; Jonathan Thornton, "Minding the Gap: Filling Losses in Gilded and Decorated Surfaces," pp. 12-17. Cotton, J. Randall. "Composition Ornament." Old-House Journal . Vol. XXI, No. 1 (January/February 1993), pp. 28-33. Green, Malcolm. 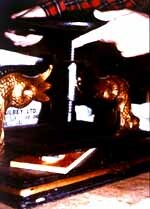 "Conservation and Restoration of Gilded Antiques." The Conservator, 3. United Kingdom for Conservation, 1979. Hasluck, Paul N. (ed.). Cassell's Cyclopedia of Mechanics , 8 vols. London: Cassell and Co., 1904, Chapter 4, p. 164. _______________. Mounting and Framing Pictures. London: Cassell and Co., 1899. Kunou, C.A. Manual of Gilding and Compo Work. Los Angeles, California: The Bruce Publishing Co., 1928. Request reprint information from the International Institute for Frame Study, 2126 "O" Street, NW, Washington, D.C. 20037. Loeffler, R.F. Step by Step Compo and Mold Making. Oroville, California: Loeffler-Valac Industries, 1992. Millar, William. Plastering Plain and Decorative: A Practical Treatise on the Art and Craft of Plastering and Modelling. London: B. T. Batsford. New York: John Lane, 1899. Scott-Mitchell, Frederick. Practical Gilding. London: The Trade Papers Publishing Company, 1905. The Gilder's Manual. New York: Excelsior Publishing House, 1876. Reprinted by the Society of Gilders, Washington, D.C., 1990. The Secretary of the Interior Standards for the Treatment of Historic Properties. Washington, D.C.: U.S. Department of the Interior, National Park Service, Preservation Assistance Division. Washington, D.C., 1992. Thornton, Jonathan. "Compo: The History and Technology of `Plastic' Compositions." Preprints of papers presented at the 13th annual meeting, Washington, D.C. American Institute for Conservation, 1985.